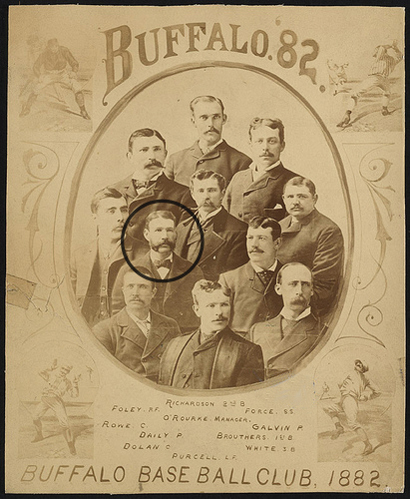 The Buffalo Bisons, 1882. Daily is circled. A one-armed Irishman with a bat… It just sounds problematic. And baseball player Hugh “One Arm” Daily was indeed a problematic guy. His predicament made it impossible for him to succeed as a hitter, but despite his handicap, he managed to have a career as a pitcher in baseball’s major leagues. Far more than a curiosity, he was for a couple of years a top-tier pitcher whose achievements included two 20-win seasons along with throwing a no-hitter and striking out 19 batters in one game – a record that lasted for a century. Aside from triumphing over disability, Daily was known for his truculence. His verbal abuse of umpires and opposing players was legion, and he once punched his own catcher while on the field. Because of such antics, many spectators loved him. But he kept getting traded, as few others could tolerate his presence. Daily was born on July 17, 1847. Most sources list his birthplace as an unspecified part of Ireland, but Baseball-Almanac.com says that he was born in County Kerry. The Society for American Baseball Research (SABR) reports that when he was four his family emigrated to the U.S., settling in Baltimore. When he was around age 13, Daily was working as a carpenter’s apprentice at a local city theater. At that time, the Civil War was taking place, so this theater doubled as a Union armory. Details are now quite sketchy, but while young Daily was engaged in horseplay with a loaded musket, an accident took place that resulted in the loss of his left hand. It’s unclear if Daily continued with carpentry, but we know for certain that he resumed playing baseball, however dubious a serious future in that sport was for him. Adding to the unlikeliness of his major league career was that, after pitching for many years in semiprofessional leagues, his performance began to decline severely. In 1878, when he turned 31, he finished with five wins and 20 losses (according to SABR). Such a record for a 31-year-old in semi-pro ball is an obvious sign that it’s time to quit and find something else to do. But Daily wouldn’t take the hint. So, with his one good hand, he clawed his way out of pitching futility. 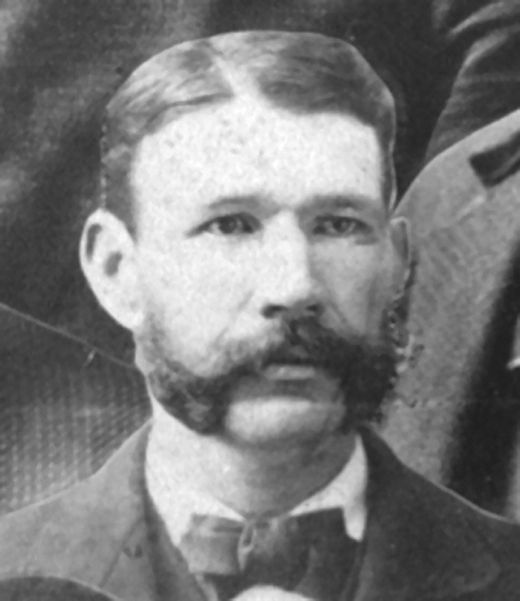 Hugh Daily in 1882 when he played for the Buffalo Bisons. He was almost 35 years old – an age when many players have already retired – when he made his major league debut on May 1, 1882, with the Buffalo Bisons (now a minor league team, but back then a member of the National League). Listed at 6’2” and 180 pounds, Daily batted right and threw right. A custom-made pad covered what would have been his left hand. When making a fielding play, he would try to trap the ball between the pad and his bare right hand, as described on BaseballLibrary.com. He could typically handle ground balls, but pop-ups with heavy spin were a challenge. In today’s more (ostensibly) sensitive culture, “One Arm” probably wouldn’t take flight as a nickname. But the media in Daily’s era was plenty willing to use it, even though the appellation was inaccurate: Daily lost his left hand, not his whole arm. Either situation, of course, is typically an insurmountable obstacle to playing professional baseball. And Daily was the first pitcher with such a condition to make it to the majors. His stellar rookie season finished with a winning record and an ERA of fewer than three runs per game. But instead of being celebrated as someone who overcame the odds, his penchant for outbursts – both verbal and physical – saw him shunned. So toxic was his presence that, at one point, his “teammates” were sabotaging their quality of play in an effort to make him lose the games he pitched and compel team management to release him. In his second big-league season, Daily pitched for the Cleveland Spiders, for whom he threw a no-hitter on September 13, 1883. Back then, five-man starting pitcher rotations were nonexistent; in fact, teams tended to rely on just two starting pitchers. So, as his team had a double-header the day after his no-hitter, Daily pitched once again, and surrendered just one run. He finished the 1883 season with an ERA of 2.42, which was fifth-best in the league. And yet the Cleveland Spiders did not bring him back for the 1884 season. For that matter, no team brought back Daily for a second consecutive season. But during the brief period they could tolerate him, teams ran his pitching arm into the ground. Some 96 percent of his pitching starts were complete games, which is a National League record. When at one point he voiced objections to being worked so much, his boss threatened to withhold his pay. When Daily’s overused pitching arm led to a decline in his performance, teams had scant reason to keep him around. Indeed, they found it hard enough to tolerate him even when he was good. Subsequent to his final big-league start on August 21, 1887, Daily spent the ensuing six years as a semi-pro baseball player, constantly changing teams, just as he had done in the major leagues. By the end of the 1890s, Daily – who had so detested umpires during his pitching career – was reportedly working as one in Indiana. As turbulently conspicuous as his playing career was, there is virtually no information about his post-baseball life. This is curious for multiple reasons: A 6’2” one-handed man tends to stand out, especially circa 1900-or-so, when men of such stature were less common. Also, his combative personality would likely have left an impression on many, if not put him in the local police blotter. But this once-volatile man seems to have eked out a quietly banal existence.